The brightest flare ever seen near the supermassive black hole at the center of the Milky Way galaxy was spotted by NASA's Chandra X-ray Observatory. SEATTLE —The giant black hole at the center of the Milky Way galaxy recently spit out the largest X-ray flare ever seen in that region, astronomers say. 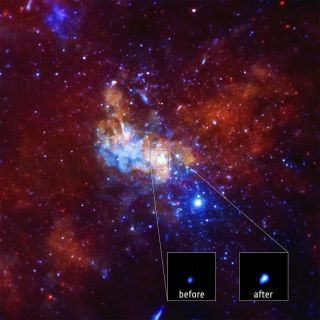 The enormous eruption from the Milky Way's core was detetected on Sept. 14, 2013, very close to the supermassive black hole known as Sagittarius A*. Pronounced "Sagittarius A star" and abbreviated as Sgr A*, the Milky Way's monster black hole has a mass that is about 4.5 million times that of the sun. Scientists unveiled the discovery of the record-breaking flare this month at the 225th meeting of the American Astronomical Society. Daryl Haggard, of Amherst College in Massachusetts, presented the findings at a news conference here at the AAS meeting on Jan. 5. Haggard and her colleagues have two possible explanations for what might have caused the flare. First, the black hole may be behaving like our own sun, which also emits bright X-ray flares. In the sun, these flares occur when magnetic-field lines become very tightly packed together or twisted, and the researchers said it's possible something similar took place near the black hole. "If an asteroid was torn apart, it would go around the black hole for a couple of hours — like water circling an open drain — before falling in," Fred Baganoff, of the Massachusetts Institute of Technology and a member of the research team, said in a statement. "That's just how long we saw the brightest X-ray flare last, so that is an intriguing clue for us to consider." Researchers saw the flare by chance while watching Sgr A* in anticipation of a different event: A gas cloud called G2 was set to make a close pass by Sgr A*, and some scientists hypothesized that material from G2 would fall into the black hole, generating a bright display of X-rays, NASA officials said in a statement. But no X-ray signal was detected as G2 made its closest approach to Sgr A*. The new flares do not appear to be part of the missing light show, according to Haggard. This time scale is characteristic of an object roughly one astronomical unit (the distance from the Earth to the sun) from Sgr A*, Haggard added. G2's closest approach to Sgr A* was 150 astronomical units, "so the time scale doesn't quite match up," she added. Haggard and her colleagues are hoping for flares from Sgr A*. With more detailed observations, she said, it might be possible to discern whether Sgr A* is rotating or stationary — a feature that can change aspects of a black hole's physiology.